Texas Hold’em is the most popular variant of poker in play today. The vast majority of games spread in casino poker rooms are either limit or no-limit Hold’em, and over half of the events at the World Series of Poker are some form of Hold’em. 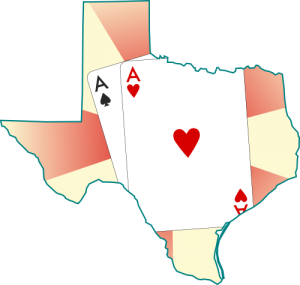 At the turn of the 21st century, Texas Hold’em quickly gained popularity over older forms of poker like Five-Card Draw because Hold’em offers more betting rounds, increasing the amount of betting action in the game, and the presence of shared cards in the middle of the table adds allows for more strategic play than many other poker variants. The object of Texas Hold’em is to form the best five-card poker hand from a combination of the two cards in your hand and five shared cards (called board cards), or to bet in such a way as to convince your opponents that you have the best hand. Texas Hold’em uses a standard 52-card deck. 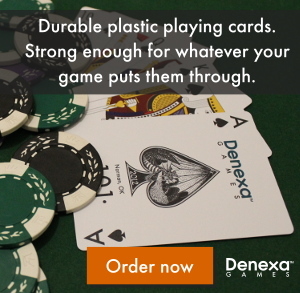 Most casino poker rooms, and an increasing number of home poker games, use plastic playing cards to ensure game integrity and reduce the number of deck changes required. 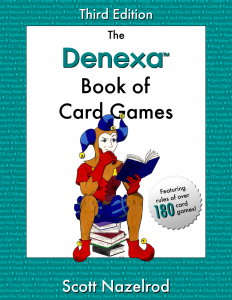 We, of course, recommend Denexa 100% Plastic Playing Cards. Prior to game play, establish whether the game is limit or no-limit and the minimum bets. You should also agree on the amount of a buy-in, that is, how much each player’s initial stake will be, and whether you will allow players to deep stack (i.e. buy in for a greater amount). All players either ante or post blinds, although Hold’em is more often played with blinds. Shuffle and deal two cards to each player. These cards are called the player’s hole cards. Players inspect their initial hand, and then the pre-flop betting round occurs. The first player to act is the player to the left of the dealer, unless blinds have been posted, in which case the player to the left of the big blind (referred to as being under the gun) has first action. The betting follows the usual pattern of betting in poker. If, at any time, all players but one fold, the pot is awarded to the last remaining player, and the hand ends. No further cards are dealt to “see what would have happened”, and the winning player is not obliged to reveal their hand. After the betting round has concluded, the dealer discards one card face down (called burning a card) and deals three cards face up to the center of the table. (See “Dealing the flop, turn, and river” for more information on how this is performed). These three cards, called the flop, are three of the five board cards, and are considered part of every player’s hand. After the flop, another betting round occurs, with first action going to the player to the left of the dealer (the player who posted the small blind). When the flop’s betting round is resolved, the dealer burns one card and deals another card face up, called the turn. As before, another betting round is conducted, after which another card is burned and the fifth and final board card, the river, is dealt. One final betting round is conducted, and then each player reveals their hand. The player who has the best five-card poker hand, using five of the seven cards available to them (the five board cards and their two hole cards), wins the pot.